I had a pang of remorse as I walked into the spa’s entry hall with one of my best friends. It was our first trip without our children or one of us being pregnant in twelve years. The Awe Spa at Moon Palace Jamaica is what mom fantasies are made of. The sound of rushing water from walls covered in fountains enveloped me walking down the hall towards the reception desk. More than anything I wish I had made more time to experience a spa impressive in design and scale. Can I fault the Moon Palace for having too many other activities that kept us from this oasis? So as I approached the front desk with less than an hour before closing, I knew I would only see a glimpse of what I had missed. We were greeted by Shala who confirmed that yes, the last appointment was at 5pm. Maybe it was the look that came over my face like my 5-year-old being told there were no more cupcakes. I didn’t even have to say anything, and Shala whipped into action. If I could change quickly enough, she suggested, the timer for the steam room would still allow me 10 minutes, and I could enjoy the hydrotherapy journey the spa offers. Before I knew what was happening, I was in the sauna with cucumber slices and ice over my eyes. I reveled in the dry heat due to a travel room companion whose temperature preferences for our suite were like those of a meat locker. Ten minutes later Shala came to fetch me for a trip across the hall to the refreshing ice room where I was told to slather my whole body in crushed ice. I complied up to my knees. From there, it was a rest on the thermal lounge beds followed by the pool where I had the coldest dip of my life that made me yelp (I was told this is not uncommon) but experienced the most wonderful tingle as I surfaced and my pores closed. The finale was a dip in the pool where I made my stops at numerous jets of differing power and a small swim. The whole experience took no more than 45 mins, less time than a typical massage, and yet it will always be one of my most memorable treatments. 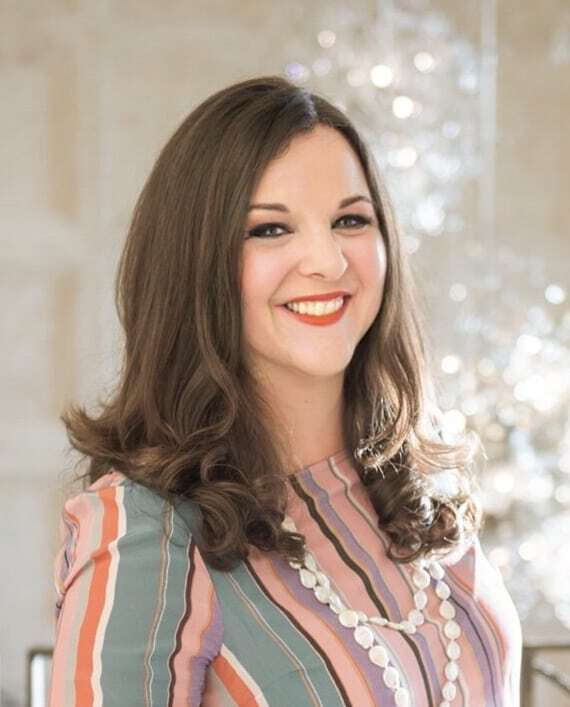 The experience itself was amazing but the “no problem, we can do this” authoritative approach from Shala combined with her beautiful poise and demeanor was a true testament to the service levels we experienced throughout our stay at the Moon Palace. 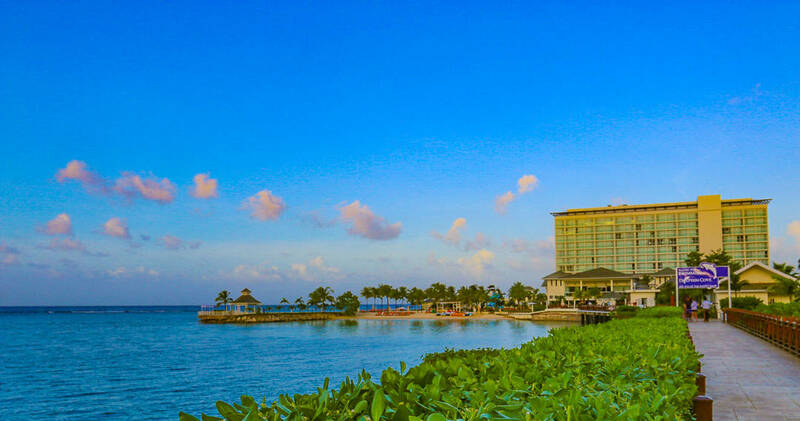 We flew to Montego Bay on Delta, who offers a Saturday nonstop from Boston and daily service from Atlanta. Delta has been my loyalty airline since I was a child. Their inflight entertainment is great for kids, and I love Delta’s level of consistent service in this age of flying with weird headlines. 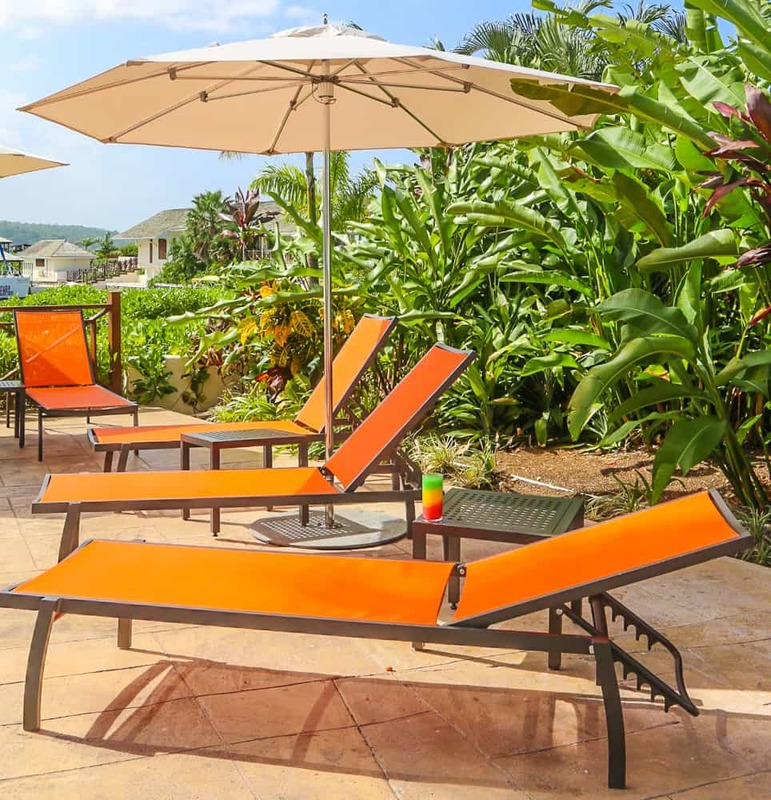 The resort is located within a secured property in Ocho Rios. Most guests take private or bus transportation that the hotel is able to arrange for you in advance. The trip takes about an hour and forty minutes. The Moon Palace Jamaica Grande lobby lounge patio area. Moon Palace has a swanky vibe. With soaring ceilings dangling clear glass sculptures and very contemporary design, the resort feels new. Restaurant and bar areas are chic and upscale. 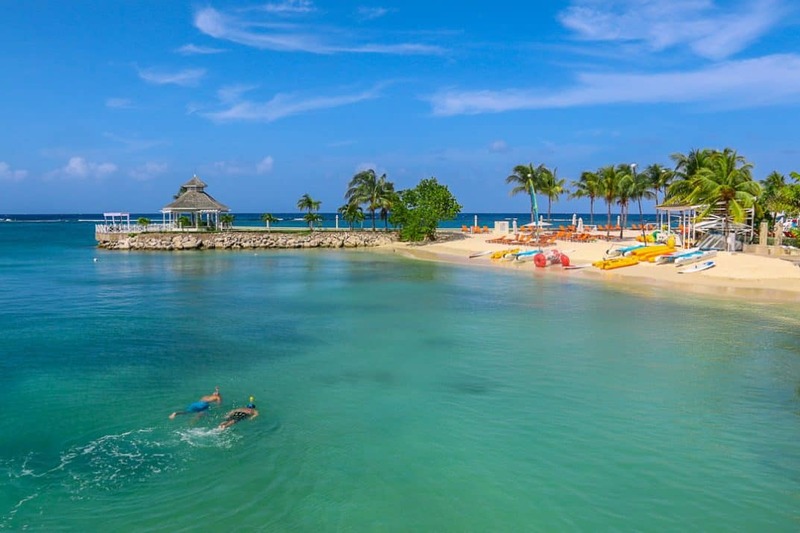 Moon Palace Jamaica offers a protected cove beach. When are all inclusives best for families? The Moon Palace Jamaica signature drink, the Bob Marley. 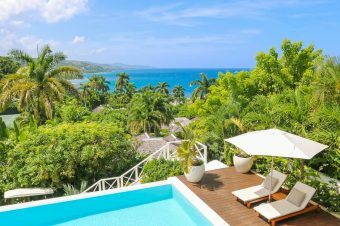 So let’s be honest about the impression the discerning traveler might have of a Jamaica all-inclusive resort. Is everyone drinking large quantities of Moon Palace’s signature Bob Marley drink, and is the noise level bordering on Spring Break mayhem? I did wonder shortly after checking in when I ordered a “virgin” Pina Colada and got a quizzical look from the bartender who then said “Oh, you drivin’?” Was this the only excuse for a non-alcoholic beverage? Apparently so. Thankfully, my doubts were unfounded, and the clientele at Moon Palace ranged from couples of all ages to families…one lovely British family in particular with teenagers that we met over the din of our Hibachi chef had been to other Moon Palace resorts in Mexico and loved them all. 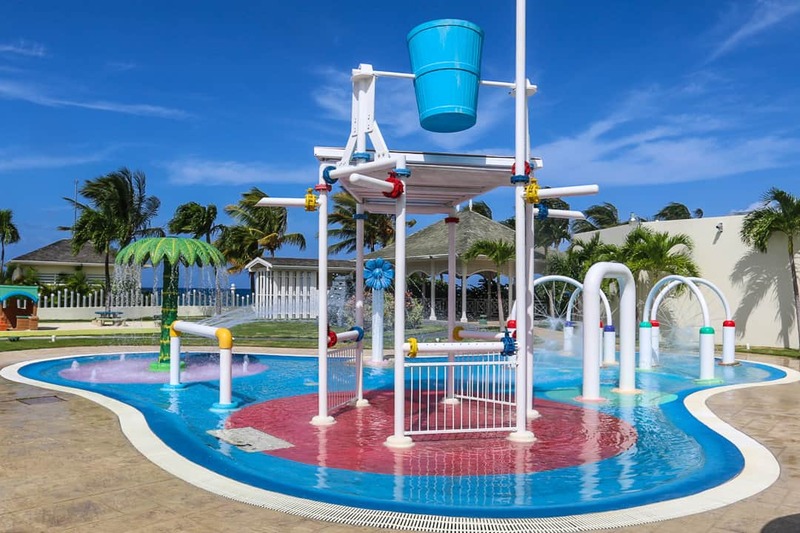 All inclusive resorts that welcome families like Moon Palace can provide some serious restorative boosts to any families with included supervised childcare and an assortment of activities. The beach at Moon Palace has soft sand and calm waters and works well for swimming and water activities. 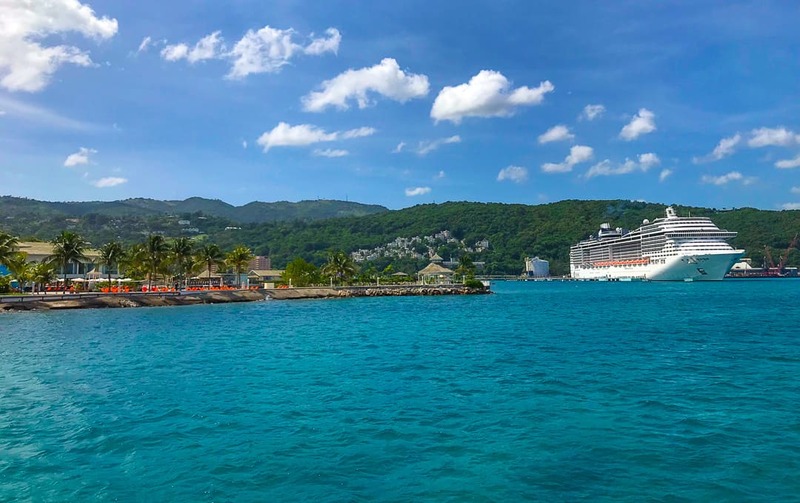 The beach is within the Ocho Rios harbor. When a cruise ship is docked, it’s scenic, and without a docked ship, it is somewhat bare. There is a lounge beach and an active beach area at the Moon Palace resort. The pool areas are expansive. I couldn’t count the number of pools. The bright orange chairs really played off the deep blue sparkle of the pools well, and at night the colored lights invited late night swimming, too. The pool areas are massive and appealing. They don’t feel crowded. 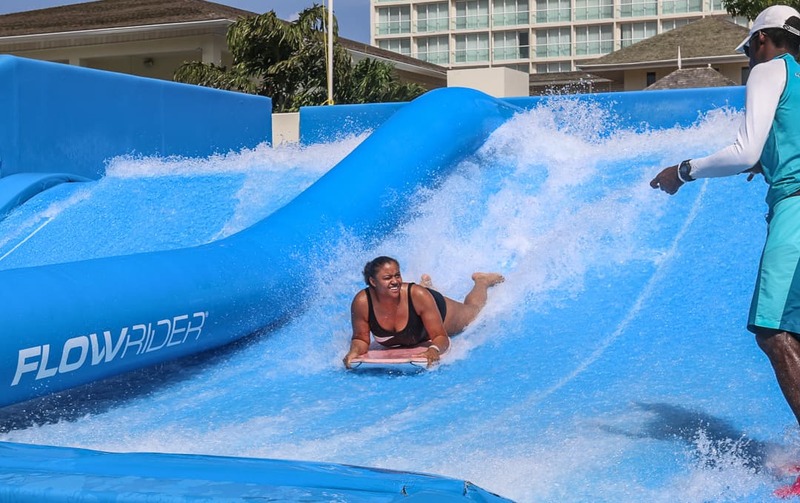 There is a large water slide and a flow rider, a surf simulator, where kids and parents try to skillfully balance on boards on foot on their stomachs before falling and being rushed up to top of the padded area. Even on your stomach, it’s a challenge. The Flowrider is harder than it looks. Moon Palace Jamaica Grande Kids’ Club are tough to beat. The kids’ clubs are included and cater to children, tweens, and teens. 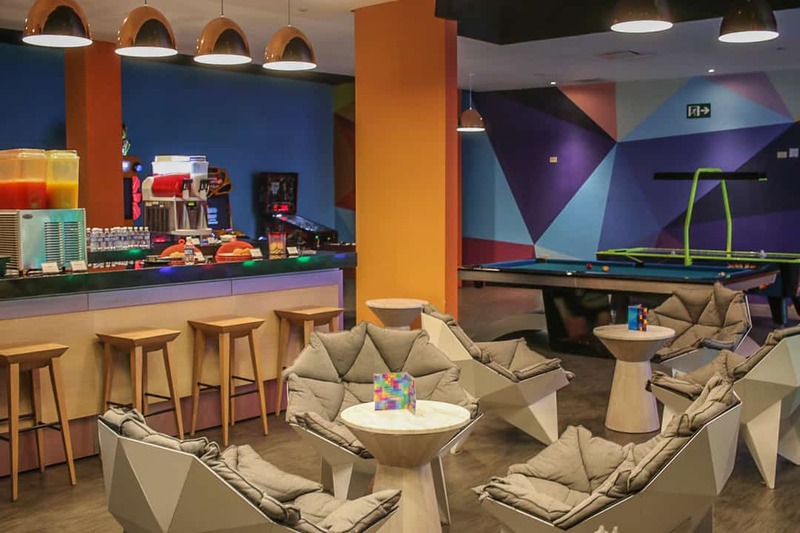 The teen room offers a snack bar, lounge area, and lots of recreation. The club for older children offers recreation and video games like air hockey, fuse ball, and arcade games. There’s a snack bar with sandwiches and ice cream for kids to take part in the 24-hour eating cycle along with their parents. And there’s even a mocktail menu for them to order colorful fruit juice drinks. It’s the club for younger kids that rivals anything I have seen at the resorts in terms of truly fun activities for 4-12 year olds. It’s not necessarily what parents what their kids doing, but it’s what the kids want to do. There is the expansive two-story ball pit space where kids can crawl through tunnels, slide down slides, and shoot soft foam balls into every direction. Two moms with no kids around couldn’t resist either. It’s really fun. Air hockey, walls of legos, miniature-scaled arcade games, and a mini stage with an audience fill the rest of this wonderland. The kids club has its own enclosed splash park for younger children. But the Moon Palace Jamaica doesn’t keep all the fun for the kids. There are kayaks, sail boats, etc and these enormous bikes that one can ride in the water. We went to the gym one morning to attend a stretch class. They looked somewhat surprised someone was up early enough to attend a morning class. They quickly found the instructor for morning stretch who led us through various movements. 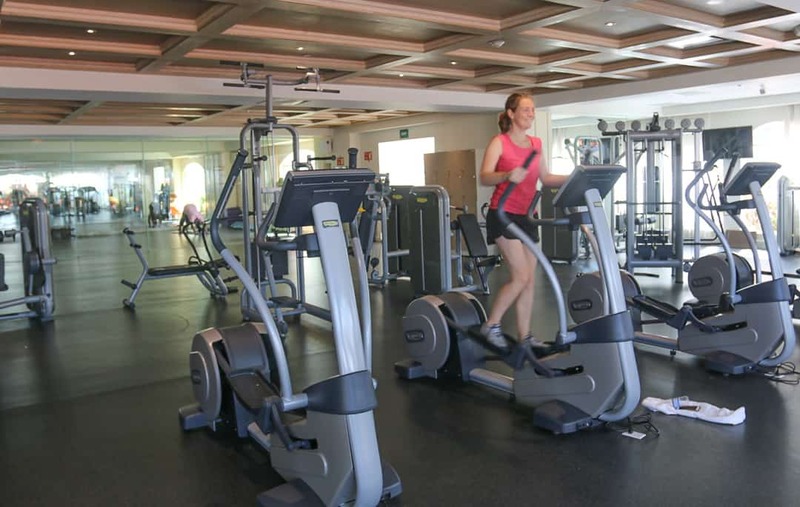 I’m not sure this is the kind of fitness center you find Stott Pilates or 500-hour certified yoga instructors walking around, but the staff was friendly and enthusiastic. We discovered we were some of the few crazy enough to work out on this vacation. At night there are several evening programs with concerts of local musicians and Jamaica heritage shows. The Moon Palace Cancun, a sister property, brings in headliner names to perform with regularity like Bonnie Raitt, The Backstreet Boys, and rapper Nelly. 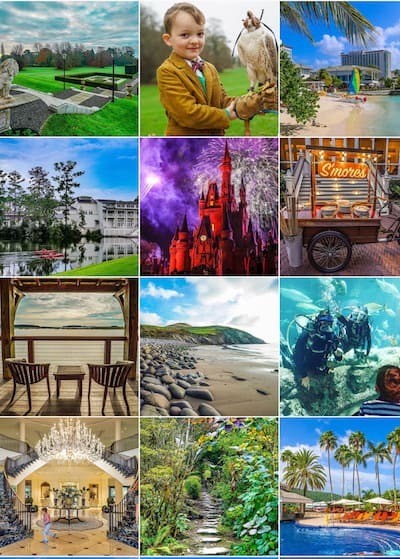 There is an on site tour office that arranges a variety of activities for guests. We enrolled in a combo scuba tour and visit to the nearby Dunn’s River Falls Park. The catamaran snorkel experience organized by the on site group at Moon Palace was flawless. 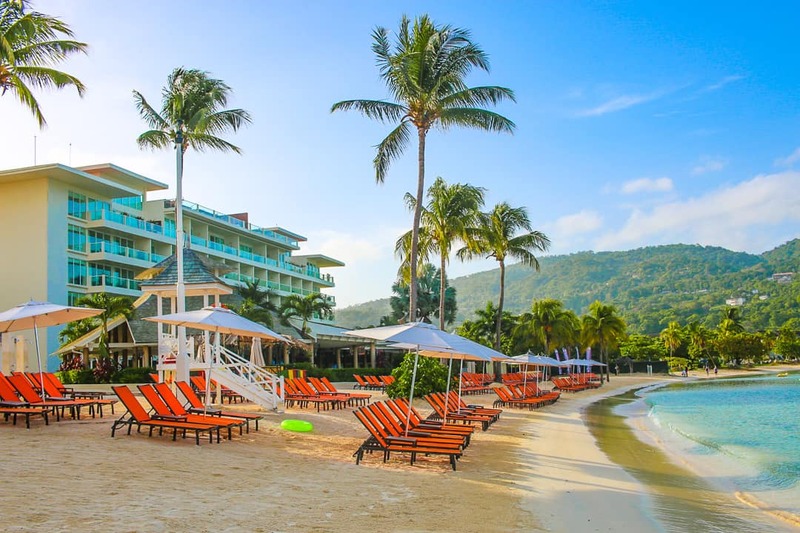 Moon Palace beaches face the cruise port of Ocho Rios. Sitting on the front of the catamaran as it flew over the bright blue water was a thrill. While the array of fish at the reef was just ok, swimming in the warm ocean water was well worth it. The crew gave guests snorkel equipment and led us to the coral reefs located next to the resort. A lifeguard accompanied the group, and all were required to wear a life vest at one’s waist. This short snorkel excursion would have been great for kids. The catamaran took us to Dunn’s River Falls and back after snorkeling. The crew’s service was perfect, and I would enthusiastically repeat any excursion with them. 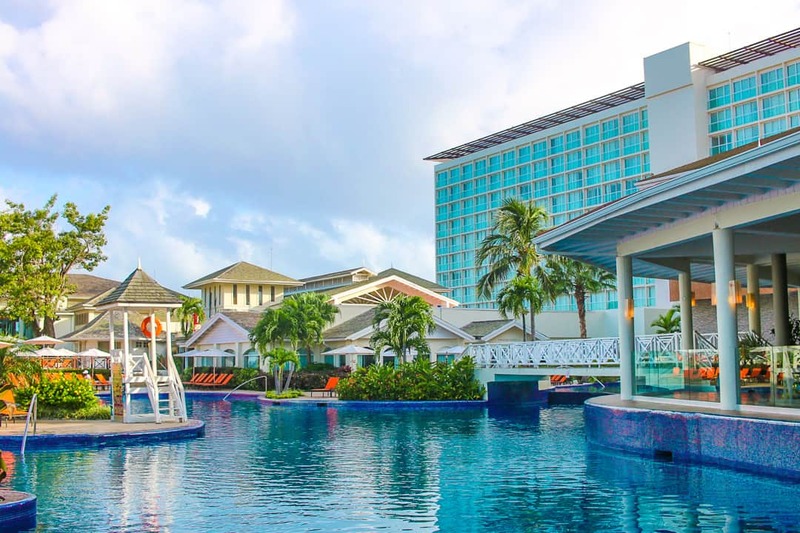 Save on an all inclusive vacation with Palace Resorts with this offer. Jamaicans will often say they prefers their rivers to their beaches. An important part of Jamaica’s identity is their waterfalls. Jamaica is one of the few in the West Indies that has its own natural springs and water supply. Their falls and rivers are a source of pride in their natural resources, and they are, indeed, special. The park at Dunn’s River Falls had some bumps, however, since we were no longer under the care of Moon Palace’s excellent service. We weren’t well prepared to understand the physicality of the experience. The tour group simply asked if everyone was climbing, or if anyone was taking the stairs. The rocks are scrubbed clean frequently to prevent slipping. Everyone is required to wear water shoes. If I had had kids with me under 10, I would have opted to take the stairs. Guides lead groups up the waterfall in a human chain holding hands. The person you are pulling behind you may define your own climbing experience. I was pulling a woman in her 60’s. At one point she fell and took me down with her. We were lucky neither of us were hurt, but the mom in me was preoccupied with making sure she was safe. This alone would have been fine, but each group is led up by a tour guide and a videographer. A practice among all of them I observed is to splash all of the groups in the face while they are making their way up the rocks. As a photographer myself, I appreciated they were trying to get people to look at the camera for their video. The videographers try and sell you one at the end. But when guests focus on their own safety and pulling the person behind them, it feels wrong. I shared this opinion like a fierce schoolmistress with our young videographer, and he stopped. Other adults would say, “Hey, cut it out!” And the response was always the same from the guides and videographers, “Hey, you came here to get wet.” Not cool. Can families with young kids still visit Dunn’s River Falls? Families should still make the journey to see the falls, in spite of the challenges climbing. There is a road along the entire falls area with snack stands and souvenir stands. People can enter and exit the falls at many levels. Children or grandparents afraid to make the whole climb can enter the flats of the falls and enjoy the water. The beach area at Dunn River Falls is tranquil for such a crowded attraction. There is also a beach on site where the falls rush into the ocean that is calm and great for kids if one parent takes an older child up the falls. The family suites are very comfortable, but they are technically two adjoining rooms with a king in one and two twins in the other. Both have exterior access, so if parents aren’t comfortable with that, rollaways in standard rooms are the best option. Rooms are well appointed with welcome fruit and cheese plates and bottles of wine. The mini fridge is stocked with water, sodas, and juices. There is also a liquor cabinet for those wanting to drink their money’s worth of the all-inclusive experience. I loved opening the closet doors to see not only a really nice hair dryer, but a flat-iron, too, to combat Caribbean humidity. Moon Palace offering Chi style tools and products is an amenity I haven’t seen yet. 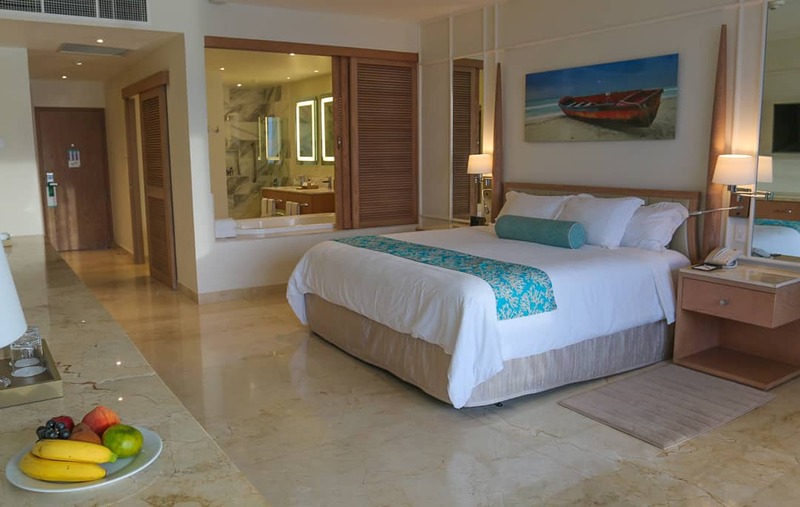 Overall, rooms were very comfortable, quiet, and very clean, and the beds were extremely comfortable. Luxury all-inclusives have some significant hurdles to overcome compared to their smaller sized peers. Serrving a foodie clientele with high expectations is the toughest. But what are the realistic standards for a venue that is serving an array of different courses all at the same time with unknown volumes of diners throughout the course of a day? The food at Moon Palace was good, and I compare this with other all-inclusives I have visited considered the most luxurious. The main buffet was very strong. Everything was beautifully presented and with a huge variety to choose from. Each meal began with a section of traditional Jamaican cuisine like ox tail stew, ackee and saltfish, festival fried dumplings, and everything in between. I couldn’t help myself but make a tasting plate of everything each meal. For research. 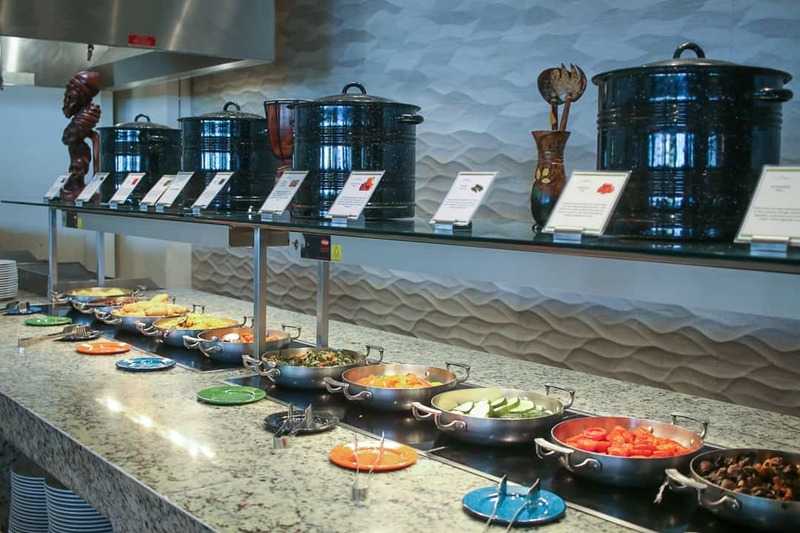 The buffet always began with local dishes at each meal to showcase Jamaican cuisine. The Boulangerie adjacent to hotel elevators had 24-hour ice cream, cupcakes, crepes, and chocolates. The last two of this list were the best. It’s probably this location that created the pounds we both gained on this short vacation. Ironically, it was at the restaurants that made our meals to order sometimes fell a little short. We dined at the Italian restaurant where the ambience and service was beautiful, but fresh seafood in delicious sauces covered overcooked pasta. We also dined at Momo, the hibachi restaurant, and laughed ourselves silly as our chef turned entertainer/singer kept us truly entertained he sliced, diced, and tossed around shrimp, chicken, steak, rice and vegetables million different ways while singing Bob Marley, Bruno Marz, Frank Sinatra, and John Legend. It was truly a show. 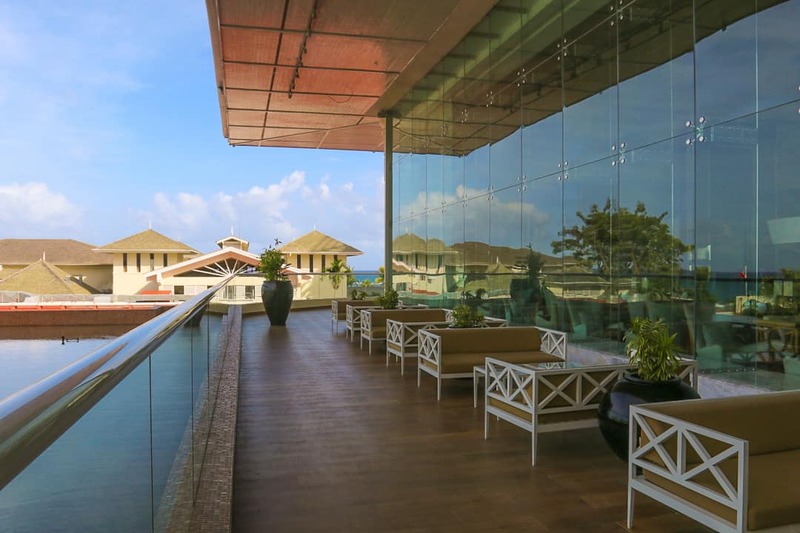 If all-inclusives should be measured by the same standards of their smaller counterparts, Moon Palace offered a five-star spa, beautiful rooms, attentive service, and a gorgeously designed resort with modern public spaces. The spa experience is just one example of the exceptional level of service we experienced. 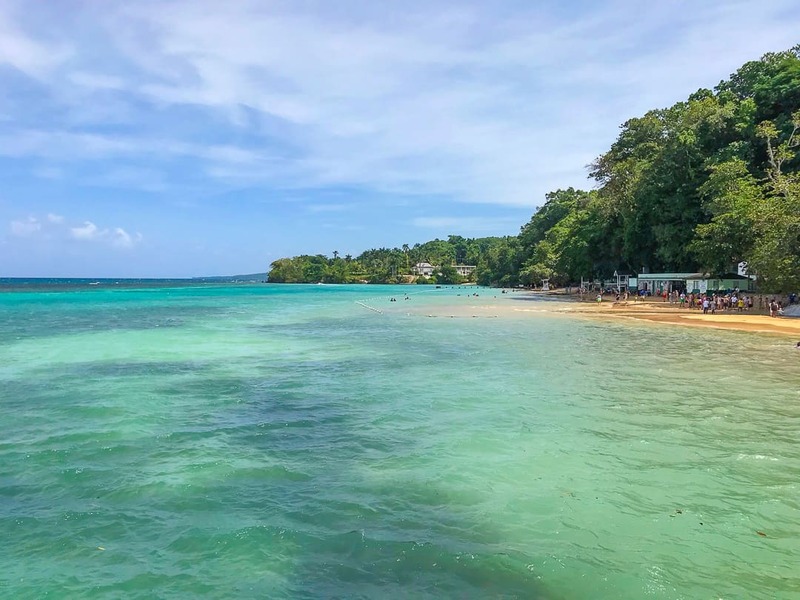 And as a first-timer to Jamaica, it was a lesson in the incredible hospitality culture that Jamaican resorts offer. Feeling an unusual level of calm on a girls getaway, we found our old friend spontaneity that has been hiding since we felt our first labor contractions years ago. We took a swim in the moonlight and didn’t care about bedtime. We left Moon Palace very full— not just from too much food but of a strong desire to return with our families. My kids looked at pictures of the kids club like a stack of Christmas presents. “Yeah, mon,” we’ll definitely be back. Although we were hosted by Moon Palace, the opinions expressed here are my own. Travel was provided by Delta airlines. I use Airfare Watchdog to watch routes of trips I want to book to save money. 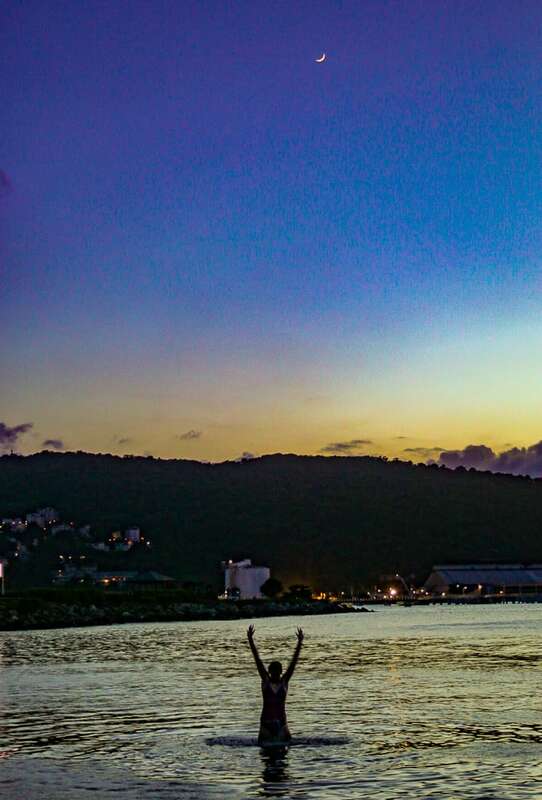 You can check fares to Montego Bay from your local airport here and set up alerts. This can save lots of money when buying airfare for a whole family.